This is part of the "Top This Gift Box" collection. 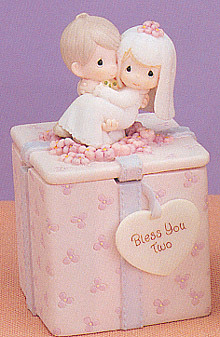 Each covered box is made of ceramic and features a cute figurine on the cover of the box. Flip the cover over, the covered box turns into a perfect gift box with a bowed ribbon on top. Each box is 3 1/2" tall. This is one of the Snowmen Candle Holder Collection. The Mommy and Baby Candle Holder measures 4-1/4" tall. The Bitty Bears - Utility Box makes a practical decoration for the home or office. It stands at 4" tall. This features adorable Bearly Babies on a train with movable wheels. The train measures at 6" tall.